This article is about the child. For the adult in the Eldergleam Sanctuary, see Sond (bandit). 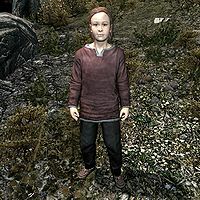 Sond is a Nord child who can be encountered randomly out in the wilds together with his friend Bottar. He wears red colored child's clothes and a pair of shoes. He carries two Dwemer cogs, a piece of Dwemer scrap metal, and a knife. He will sell you a waypoint to Deep Folk Crossing for one septim, or will give it to you for free if you choose to intimidate him. He has some items for sale. When first encountered, he says "Hey there. Check out what my friend and I found. I can sell some of it if you want!" When prompted about where it was found, he tells you they found it at "an old Dwemer bridge to the far west" and he says he "can mark the location down for you on your map if you want, for a small fee". Here you can either give him a Septim or intimidate him into marking the location on your map. He sells a few dwemer items such as cogs and scrap metal. This page was last modified on 18 December 2013, at 04:53.